From October 2013 to July 2014, Jude received four cycles of intense chemotherapy and faced lengthy hospitalizations, difficult side effects and months of home isolation (except for trips to the clinic). 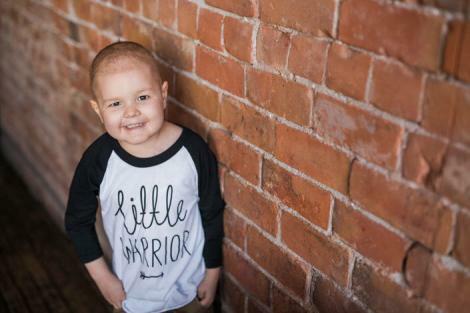 Jude's younger brother, Finn, was born in May 2014 in the middle of Jude's final intense chemotherapy cycle. In August 2014, his family celebrated as Jude finished the more difficult part of treatment. Unfortunately, the following year in 2015, Jude had an early leukemia relapse, which typically has a poor prognosis. His family traveled to the University of Minnesota Masonic Children’s Hospital – a pioneering institution in cord blood transplants. Just as Jude was recovering from a grueling stem cell transplant, he relapsed yet again. If this had happened more than two or three years ago, there would be no options left for Jude except hospice care. However, Jude was able to participate in a groundbreaking new clinical trial at Seattle Children’s Hospital for CAR T-cell therapy where scientists were able to modify Jude’s own cells to fight the leukemia. The CAR T-cell treatment worked – but only briefly – and Jude relapsed again in April 2016. His family traveled again to Seattle Children’s and then to a different trial at Children’s Hospital of Philadelphia, but neither trial worked to beat Jude’s leukemia back into remission this time. Left with no other choices, his family returned to Tucson to try a new immunotherapy drug recommended by his team at Banner-UMC. This drug worked within ten days and Jude was a candidate for a second bone marrow transplant. This time, his family decided to stay in Tucson under the care of renowned transplant doctor, Dr. Emmanuel Katsansis. Jude recently celebrated 18 months being cancer-free after his second transplant and is now a happy, curious kindergarten student. This is the longest Jude has been off treatment and cancer-free since he was first diagnosed. While Jude faces extra challenges because of the side effects from all the treatment he endured, he is a bright, joyful child ready to take on the world.